WASHINGTON (CNS) — Religion matters but relationships among people of different beliefs matter most when it comes to peacebuilding efforts, said a group of panelists at the introduction of a new Catholic Relief Services publication about Muslim-Christian cooperation around the world. “People who identity as Muslim or Christian have had a history of 14 centuries and they have been marked by periods of great turbulence but also by periods and places where there has been considerable mutual thriving,” Tom Bamat, an independent consultant and former CRS senior adviser for justice and peacebuilding, who was moderating the April 26 discussion at the Carnegie Endowment for International Peace. Aid agencies as well as development organizations have realized the importance of religion and the role it plays in development and peacebuilding efforts, and in its “Interreligious Action for Peace: Studies in Muslim-Christian Cooperation” publication, CRS seeks to share what it has learned through its work in various parts of the world. The book showcases lessons learned in bringing about cooperation between Christians and Muslims in some places where CRS has projects, such as Bosnia-Herzegovina, Central African Republic, Kenya and Mindanao, the second largest island in the Philippines. 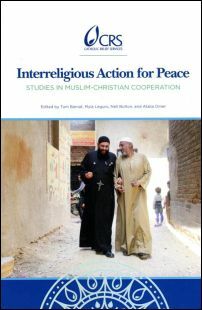 The publication emerged from a 2015 workshop in which CRS project teams and expert advisers gathered to reflect on lessons learned out of those projects and to talk about the future direction for interreligious action and social cohesion, says the book. In a world where there are concerns about injustice, infringements on religious freedom, mutual intolerance and extreme violence, “we really need a much greater interreligious understanding, greater solidarity and cooperation,” Bamat said. Panelist Andreas Hipple, a senior program adviser for global development at GHR Foundation, who wrote the foreword, said there is a growing consensus that religion matters, particularly in efforts of peacebuilding around the world. Donor groups and organizations that deal with development are increasingly asking about how to partner with religious groups because of their influence in society, he said. “Faith actors are so instrumental in the daily life of any individual or any family, and institutions,” in many places, it would be a mistake to ignore them, Hipple said. Panelist Ayse Kadayifci-Orellana, associate director of Salam Institute for Peace and Justice at Georgetown University, who has studied the role of Islam and religion in peacebuilding and conflict resolution, said that after 9/11, “the role of religion became an important element” in peacebuilding.